Yamaha RX-V365 review | What Hi-Fi? 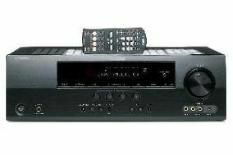 The RX-V365 is Yamaha's cheapest multichannel receiver for 2009. And, with the entry-level price tag comes an entry-level feature set. Those of you requiring more than a couple of high-definition sources might find the dual HDMI inputs on the miserly side. If you're looking for a medium through which to play Blu-ray discs, it's also worth noting that this amp is incapable of decoding HD audio formats such as Dolby TrueHD. Wait, there's more. The 'V365 won't accept audio through those HMDI inputs either. You'll need a Blu-ray player that can decode HD audio onboard (such as the Sony BDP-S550) and feed them into the Yamaha's multichannel analogue input. Alternatively, you can bitstream the core DTS and Dolby Digital audio from a Blu-ray disc to the amp's optical or coaxial digital inputs. The spring-loaded speaker terminals on the rear of the receiver are a blast from the past and cater for the surround and centre channels. The front left and right channels use traditional binding posts. Considering the budget price, the inclusion of Yamaha's automatic speaker calibration system is welcome, if not wholly accurate. The system made a couple of errors when it came to determining the sizes and distances of our reference speaker system. For an entry-level amp, the 'V365 kicks out a loud, powerful sound. During Death Race, the on-screen action sounds forceful enough, although the tautness and definition of each collision or explosion isn't up to the standards of the class leaders. You don't get the same dynamic shifts as the top performers at this level either. The Yamaha does a good job of steering surround effects and filling the surround field with gunfire. Bullets fly between channels with vigor, but not at the expense of dialogue clarity. We understand that entry-level home cinema receivers won't adorn you with bells and whistles. But, despite the RX-V365's commendable sonic showing, we'd still like more of the basic functions we've come to expect at this price.